Having just returned from Blackford Hill, sunbathing and reading my new copy of Q magazine., I got a call from Damo, asking if I would go to the Usher hall to review the Royal Concertgebouw Orchestra. as part of The Edinburgh International Festival. Reviewing bands, ballet, comedians & theatrical performances is one thing. – but reviewing a hundred piece orchestra is another. The Usher Hall was packed to the rafters. Having press allocation ensures the best seats in the house. For a moment I felt guilty at the privilege of this blues-busting experience. Then the Orchestra arrived, taking their positions on stage, the ladies dressed in the most elegant of dresses, long and black. The gents in traditional tail-coats. They all looked very nice. Then the star of the show arrived, Mariss Jansons. The Usher hall erupted with excitement as the orchestra tuned into this Grand Master of the Baton. Interestingly, Violin seemed to be a girls thing and Cello a boys thing. I’ve always associated Cello with Girls, because of the instrument’s sensual nature and the way it is held between the legs. 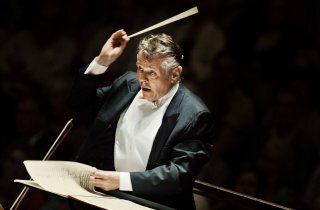 (Think Susan Sarandon in “The Witches Of Eastwick.”) Then Mariss Jansons waved his Baton and waves of sonic fidelity bathed me in bliss. The first piece, Symphony No1 in F minor., composed by Dmitry Shostakovich, was such good medicine, and I was transfixed by the conductors control and power to conduct who played what and where.His moves were ever graceful and Divine sank further and further into Classical heaven. It was a catch 22 position. Did I close my eye’s and drift off into the world that the music wanted to take me.or did I keep my eye on the conductor and marvel at the way he controlled the talents of his orchestra. Multi-tasking was key; there was so much going on upon the stage, & I didn’t want to miss anything. My senses were engulfed to the max, as a smile spread across my face I realized that I was really, really enjoying this. During the interval, there was an old man sat next to me who had been following the musical script in a book he had with him. Reading the musical notes as though he were reading words from a book. I asked him if he could hear the music in his head as he read the music. His reply was, ‘sometimes.‘ Then I discovered that he had been a conductor for the Leeds Symphony Orchestra up until 1976. I was engrossed with his tales of conducting in Yorkshire. The second half of the performance.Ravel. Piano Concerto in G major. I had been so engrossed in my conversation with the old master that was sat next to me, Tthat I hadn’t noticed that a Grand Piano had taken center stage. Aside from African hand drums, piano is my second instrument and now was my chance to see Jean-Yves Thibaudet in action. As he took to the stage, the audience’s applause nearly took the roof off. To have this close a view of this genius at work really was a blessing. The almost psychic link between pianist and conductor as the piece began with a crack of a whip and then the skill and dexterity of the fingers that brought Ravel back to life. I was amazed ,inspired and very very entertained. What also amazed me was the pianist’s ability to perform this dramatically complex piece without sheet music. The atmosphere of the Usher Hall was multi-orgasmic as the concerto reached its climax. I was speechless. This wasn’t a Master Class. This was a Professor class.